Choosing the best hair dryer for your hair type can be tricky, as each heating technology’s designed for a different hair type. Why not take a moment to read our quick guide to the best hairdryer heating methods for each hair type? Along with these important drying features, the best hairdryers may offer extra tools, to make styling easier and longer lasting. These may include a straightening comb, powerful quick dry nozzles and clips for sectioning hair. Moreover, easy maintenance is important to get the most our of your hair dryer, so look for removable end caps that make it easy to clean lint from air-filters. Think about where you usually use your dryer, is it conveniently near the mains socket, or do you need a long cord? Is the dryer a comfortable weight and well-balanced to save your arms and wrist from strain? Are the control buttons easy to use and does the handle have a comfortable grip? To save your sanity, we’ve reviewed the 5 best hair dryers on offer right now, with details of their features, benefits and any little disadvantages! Our best value hairdryer is the Conair InfinitiPRO, which is a popular best-seller you can use on lots of different hair types. And that instantly makes it family-friendly – plus you get a concentrator and a diffuser in with the affordable price. The Conair InfinitiPRO runs from a powerful 1875 watt AC motor, which will be more durable than a DC motor model. For speedy hair drying on a variety of people, this dryer offers both ionic and ceramic heating systems. Ceramic-heat dries hair quickly, but gently, making it especially suitable for fine or dry hair. But the ionic drying setting reduce frizziness in curly hair and is also good for drying thick, straight hair. This model has 3 heat settings plus two different speeds. 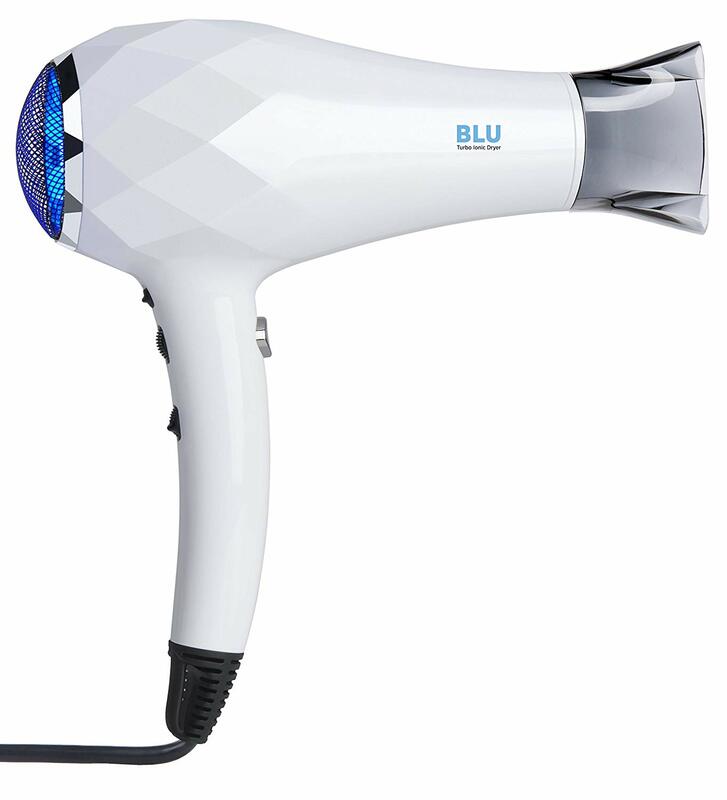 It’s quite a noisy device at a peak of 85.5 decibels and the temperature can range from 108º to 159º F. With a cold-air-blast button included in the features, it’s a good hair-styling tool to share between various people. This is a light-weight 1.1 lb. hairdryer, with a 6-feet cable, which is a little on the short side. The attachments fit well and are easy to put on and take off. 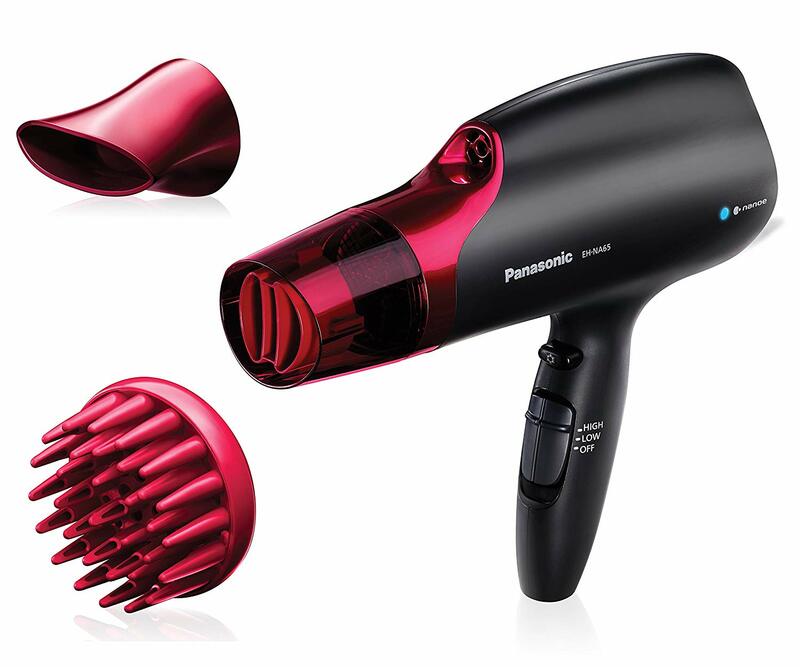 The Panasonic Nanoe EH-NA65-K was easily the best hair dryer for curly hair that needs long-lasting, frizz-control. It’s also one of the quietest devices, reaching its highest noise level at 79.8 decibels. So if loud noise gives you a headache, this is definitely one of the best dryers for you. It looks sleek and modern, with a special shape to get the best air-flow over nanoe heating technology. Nanoe is the trade-name of Panasonic’s ‘electrostatic atomized water-particles’, which impart moisture to hair. And in terms of improving curly hair drying, we found that it keeps frizz under control, leaving a ‘well-styled’ finish. The accessories include a diffuser, quick-dry nozzle, concentrator and a cool-shot feature. In common with all the dryers we reviewed, the Nanoe has a special ALCI safety plug, which stops the flow of electricity if the dryer is dropped into water. And now it’s available, I would never buy a hairdryer without that safety-feature. You can remove and clean the air-filter easily for good maintenance and the cable is a good length at 9-feet. We liked the thoughtful cord-wrap feature, which is something that should have been invented years ago! The controls are easy to reach and use, but strangely, when they aren’t set so they lie parallel, the handle feels uncomfortable! The Nanoe’s temperature spread is 120º – 197º and weighs 1.7 lbs. This model has a 2-year guarantee. We found that the Instyler BLU Turbo Ionic Hairdryer is the best hairdryer for thick hair. It has a 1500 watt DC motor, which is lower in wattage than the other dryers. However, with lightweight, thin blades, the motor’s Turbo setting for thick hair gives powerful jets of air equal to a 2000 watt device. It’s also great for allowing tight control over the air-speed, with the Variable Air-flow Control and 2 heat-settings, which makes styling different hair types easier. We liked the compact design and lightweight handling at 1.3 lbs. And the cable is nice and long, at 9-feet plus a handy cable-wrap feature. The Instyler BLU Turbo combines tourmaline technology and a ceramic grill, which means it’s good for coarse, thick hair and other hair types, too. The attachments aren’t the sturdiest, but they do fit very securely on the dryer’s nozzle. It’s not easy to clean the filter, as the end-cap doesn’t come off at all. 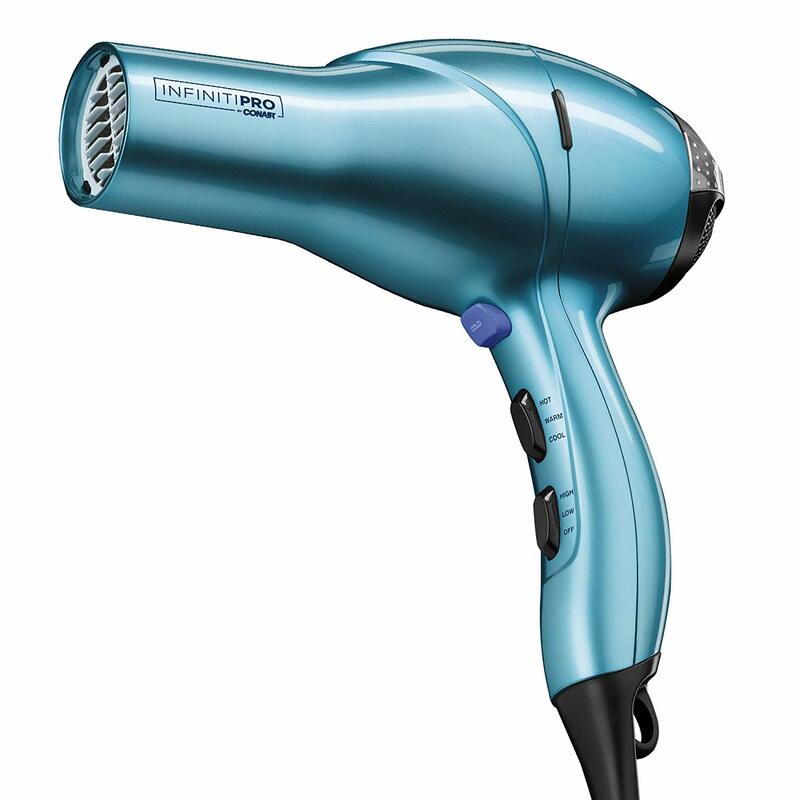 We chose the well-designed, Revlon Perfect Heat Fast Dry hairdryer as the best travel hairdryer. It’s very lightweight and compact, with a folding handle for easy packing, and has dual-voltage, so you can use it in any country. The Perfect Heat Fast-Dry lives up to its name with an 1875-watt motor that combines ceramic and ionic heating technologies. The temperature range is good for fine and coarse hair types at 117º – 169º, but it doesn’t have as many temperature and air-speed options as full-size hair dryers. With just one accessory, a concentrator nozzle to smooth and straighten, you won’t have the full range of styling options. We found the concentrator kept falling off in use, which was annoying. The endcap is easy to take off for clearing lint from the filter. And the Revlon Perfect Heat comes with a longer than average 3 year guarantee. 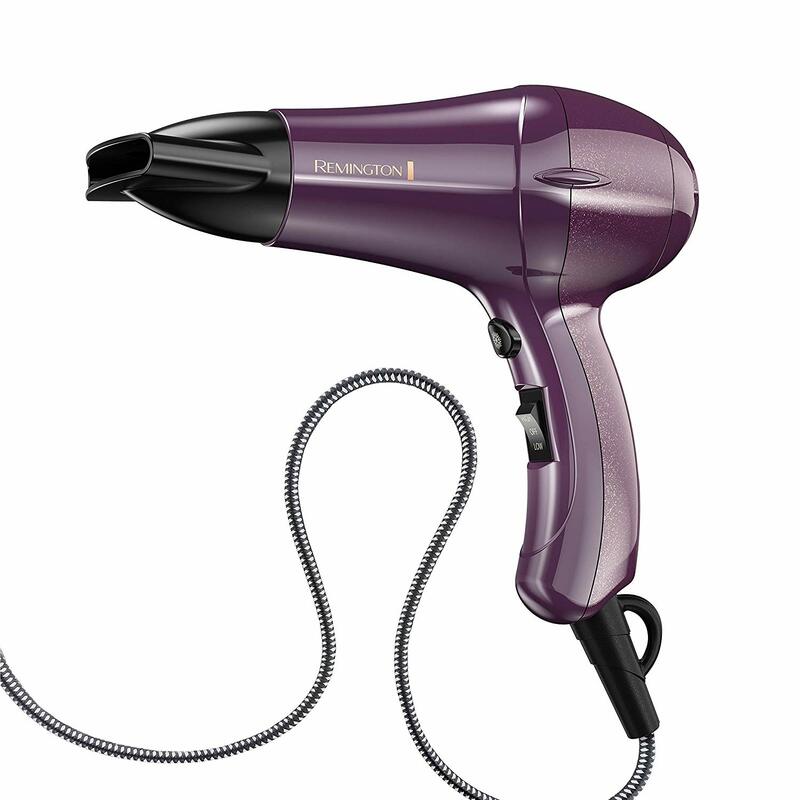 This luxury, Remington hair-dryer was such a joy to use that it easily won our award for all-round, best hair dryer! 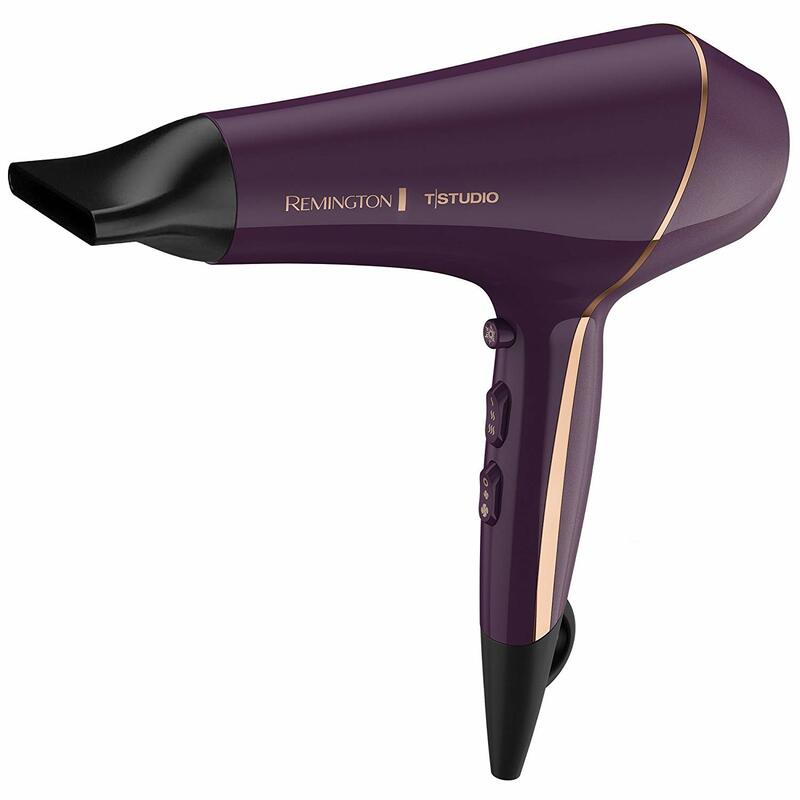 To ensure it does a great job on all types of hair, the Remington-Pro offers ceramic and thermal heat options. So the ceramic setting dries gently with full heat distribution through the hair, making it especially safe for dry and fine hair. And the thermal heat option is fantastic for producing even heating, which dries all other hair types efficiently. The 1875 watt motor is powerful, but comparatively quiet. And the different settings from 80º – 169º make it effective on long hair/thick hair and fine or delicate hair. Maintenance is easy with a removable filter to prevent lint blocking up the air-flow, and the dryer weighs 1.7 lbs. The 7-feet long cable is tangle-free, making it easier to manipulate than some hairdryers. And there are 2 concentrators, 3 clips and a diffuser for a defined finish on curly hair. The accessories are better quality than the attachments on most other hairdryers and never fall off during use. With a 4-year guarantee Remington is obviously confident in the long-term durability of this top-quality product. 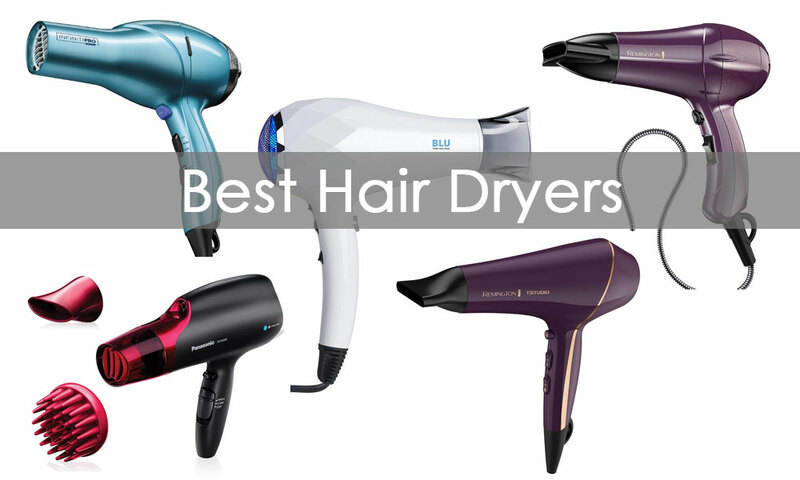 What’s the difference between very cheap hair dryers and the best hair dryers reviewed here? A cheap motor will burn out fast and you’ll need to buy a new hairdryer within 2 years. And if you buy a powerful hairdryer, which dries your hair faster, it will definitely minimize the amount of heat-damage your hair suffers. The more you pay for a hairdryer, assuming it comes with a guarantee of 3 or 4 years, the longer it will last. And that could be 10 years or more. So choosing the right drying method can make a huge difference to the quality of your hair-styling. Buying a durable, higher wattage hair dryer may seem expensive now, but not so much when you spread the cost over ten or more years use!